The planets range hugely in sizes, Jupiter is more than 300 times as massive as Earth. But the sizes of the large moons seem to be uncorrelated with the sizes of the planets they orbit. Why doesn't Jupiter have a giant moon with a mass hundreds times larger than the Earth's Moon's? Among gas giants, Saturn at a third of Jupiter's mass has the largest of all moons and Triton way out at 30 AU Neptune is the 7th largest of all moons. The theories of the origin of the moons seem to vary much too, without explaining any upper size limit. The Moon was formed by an impact. Triton and maybe Titan were captured. Other large moons were formed along with their planet. Is this upper size limit on moons imaginary, coincidental or is there some reason for it to be this way? I of course mean a hypothetical expected upper size limit for exomoons in general, not only statistics about the Solar System moons. The wonderful illustration here is from Emily Lakdawalla at The Planetary Society, it is now my desktop background. Small point, but Ganymede is slightly larger than Titan as moons are measured by their solid surface, though with atmosphere, Titan appears slightly bigger. The drawing is probably accurate, but slightly misleading. It's worth adding that Titan is out-gassing so it may have, quite some time ago, been larger than Ganymede. 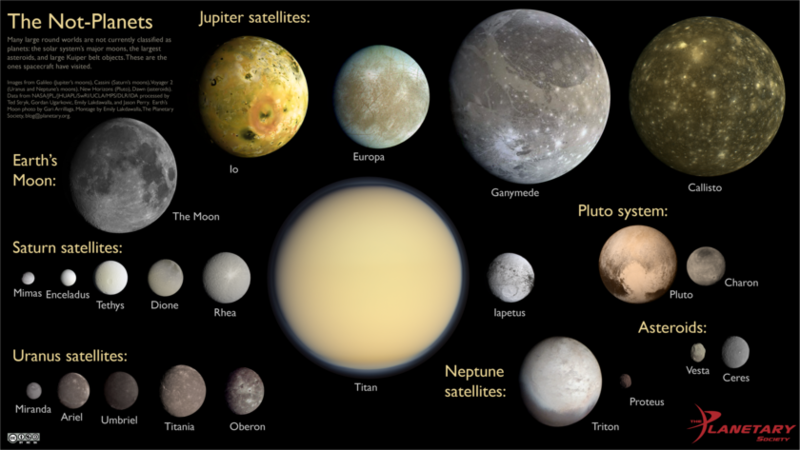 According to wikipedia, the larger, close to Jupiter and Saturn moons are unlikely to have been captured moons. The largest co-formation ratio is Titan to Saturn, about 1 to 4,000 in terms of mass. Ganymede to Jupiter, less than 1 to 12,000. The wiki article points out that ratios of 100 to 1 are likely giant impacts and you're unlikely to see that kind of ratio in co formation, so a conservative estimate, the largest co-formation you mgiht see might be around a few hundred to 1. If you figure the largest planets are about 12-12.5 Jupiters (more than that, they become brown dwarfs, though a cool brown dwarf orbiting a sun might get called a planet too at greater than 13 Jupiter masses), but lets say, 12 Jupiters. That's about 4,000 earth masses. If we look at a co-formation ratio of a few hundred to perhaps over a thousand to 1 as about the maxiumum, there's a possible ballpark answer of a handul of earth masses might be about as big as a co-formation moon is likely to get in a perfect formation situation, And those would probably be pretty rare. Giant impacts are different. Pluto-Charon could be an impact generated dwarf planet/moon system and Charon is 1/8th the mass of Pluto. How likely that kind of impact is to happen on a super earth is hard to say, but theoretically a super-earth with a giant impact could have a large moon too - a bigger earth with a bigger impact and bigger moon, but there's problems here. Giant planets are likely to form close to the sun and the orbital sphere of influence gets smaller closer to the sun. Also, giant planets might tend to form thick gaseous atmospheres, retaining all their hydrogen and helium, so too big, it might begin to resemble a gas giant, which aren't as good at creating debris when impacted, so there's a few limiting factors here and we might be limited to, certainly several times larger than our moon, but perhaps not as large as co-formation moons, further from the sun. Finally, moon capture. While there's no examples of this in our solar system, I see no reason why a large planet couldn't capture another planet, though you then have to determine whether it's a co-planet orbit, which I think a captured planet should be considered, or whether the captured object is a moon. - personally I think a captured planet that orbits a planet would be a co-planet system, so I don't like the capture as a method for getting as large a moon as possible, though I suppose it could be looked at either way. We know almost nothing about moons in other solar systems (exomoons). The observations are just barely possible with current technology, but very difficult. That's likely going to change in the next few years, but for now we know virtually nothing in other solar systems, so, any present predictions on the largest possible moons would have to be modeled or estimated. I saw this presentation of the National Academy of Science 2015 where Dr. Robin Canup explains, illustrated by simulations, that many large moons formed sequentially around giant planets. But their growing mass thru accretion caused perturbations in the gaseous planetary disk ("type I interaction") that drew them inwards to collide with the planet within a million years. The total mass of all the satellites to the planet's mass remains fairly constant given (partly) the density of the Solar Nebula. The larger moons crash into the planet while new moons are growing larger. The process stops when the Solar Nebula has been exhausted. So I suppose speculatively that different exoplanetary systems might have different moon size ceilings. Impact formation size of Earth's Moon, in the middle of the Jovian moons, is a coincidence according to this model. Not the answer you're looking for? Browse other questions tagged natural-satellites formation size or ask your own question. If earth were the size of a marble would it be smoother than a marble? What exactly is a “moon”? Is there any known moon of a moon?